1/7/18: Join the ‘We All Count’ Homeless Census! The number of homeless people appears to be rising alarmingly in San Diego County, and we all need to work together to stem the tide. The ultimate solutions are profound and multi-faceted. But one thing is clear. We need to know how many people are living on our streets and what direction the trend is going. 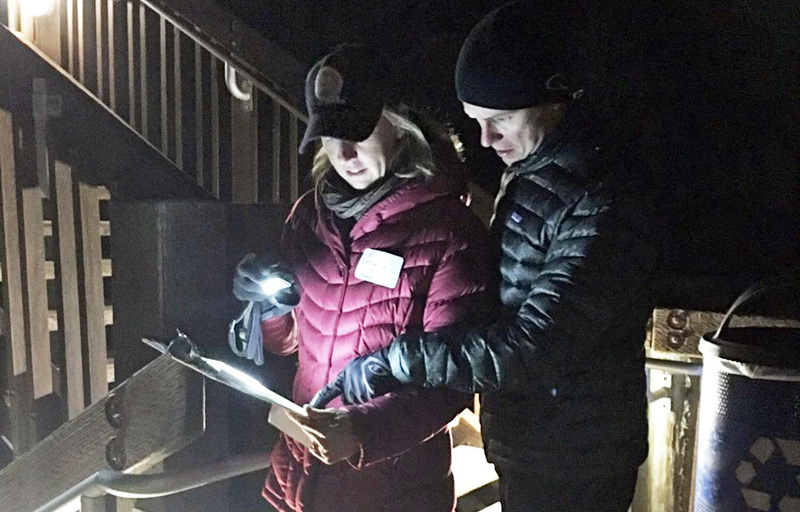 I invite you to join me and other volunteers in the early morning hours of Friday, January 26, to help count the number of people living unsheltered on Encinitas streets. To sign up, you can click here. The We All Count Homeless Census happens yearly at the end of January across the country. The information we’ll gather is used at both locally and nationally to help inform discussions and decision-making around homeless issues, funding, and the design of a system to assist people who don’t have a roof over their heads. It’s considered a minimum representation as this interesting article about the yearly count points out. My husband Jeremy and I pore over a map in the early morning hours during last year’s homeless count. Knowing how many people exist on the streets, in cars and in shelters – then tracking those yearly statistics – allows us to craft meaningful solutions. As San Franciso Mayor Ed Lee said, “Data drives action. That’s what this night is all about.” The ultimate solutions will help people avoid falling into homelessness, getting them out of it quickly, and deal with the realities of those who live without homes for long periods of time. On the face of things, it’s obvious what homeless people need – homes. But every person has a different set of circumstances that led him or her into homelessness. It’s not financially feasible, or even desirable, to simply provide homes for those who need them. We need solutions that help people create or access the necessary resources to support and maintain their own homes. Several years ago, we struggled to recruit enough volunteers in Encinitas to accurately canvass the city. Last year, I participated in the count and issued the We All Count Challenge. More than 70 volunteers signed up and our Community Resource Center (CRC) was able to fill their roster and get a comprehensive count for Encinitas. To give you a sense of the issue, here’s a snapshot of last year’s We All Count census: 117 people in Encinitas were homeless (84 unsheltered and 33 in shelters). In contrast, San Diego City had 5,619 homeless (3231 unsheltered and 2,388 sheltered). Carlsbad had 160 homeless (101 unsheltered and 59 sheltered). Oceanside had 531 homeless (361 unsheltered and 170 sheltered). The sheltered group are in emergency shelters, or transitional housing. 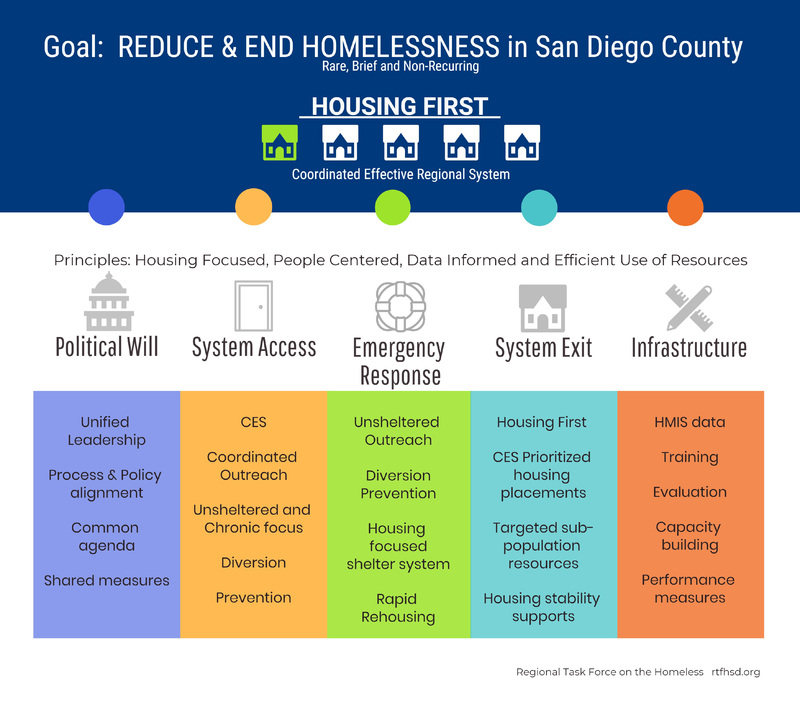 The entire San Diego County total was 9,116 homeless people, with 9% located in North County Coastal. Of the unsheltered group, 69% were men, 29% women, and 2% transgender; 8% were veterans and 31% were chronically homeless. Of the unsheltered homeless, 77% became homeless while living in San Diego. 40% had self-reported mental health issues. This graphic illustrates how we can render homelessness “rare, brief and non-occurring.” Click to enlarge. For lots more information from the San Diego Regional Task Force on the Homeless, click here. In Encinitas, we don’t have a homeless shelter. But the number of people living on the streets is increasing, and correspondingly, so is the number of complaints and questions about homeless people. There is no easy solution. It’s not a crime to be homeless. But out of compassion for people suffering and the desire to keep our public places safe and pleasant for all, it’s important that we substantively engage with this issue. The Community Resource Center (CRC) in our downtown does an excellent job helping those facing hardship. Last year, the CRC provided more than 500,000 pounds of healthy food to more than 1250 families; gave 150 women and children safety in their domestic violence shelter; and provided more than 1200 counseling sessions. The City of Encinitas has provided more than $100,000 for a dedicated “housing navigator,” who found stable homes for 39 previously homeless people in Encinitas. This is a great development, but it is only the beginning of what needs to happen. The We All Count 2018 Homeless Census starts at 4 a.m. and you’re all finished before 7 a.m., just as the sun is rising. Coffee, bagels and warm drinks are provided at the CRC. If you want to volunteer in another city, you can choose that city at the link below link. To join us or learn more, please click here. I hope to see you there, making a difference in the pre-dawn Encinitas darkness! P.S. If you’re interested in some perspective on recent and future local issues, I recap 2017 and explore our city’s prospects for 2018 in the current issue of The Coast News.